What are the camp highlights? The retreat runs from 2pm Friday to 6pm the following evening, and includes sessions on HIIT training, yoga, mediation, art, along with yin and hatha yoga. Each class is led by an expert in the particular field and due to the small class size, each session is tailored to the different levels of proficiency in the group from campers who are completely new to a field right through to advance level. Alma is particularly good for those interested in yoga, with everything from sunrise meditation classes to hatha classes held at the top of nearby small hill. 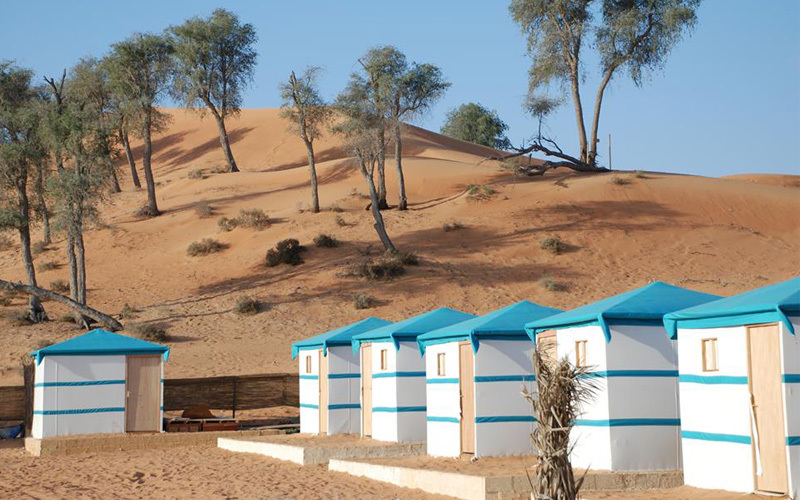 Despite being out in the desert, the camp is more ‘glamping’ than camping. Each tent has a double bed, separate ensuite bathroom, bedroom fan and front porch seating area. The camp also has a communal Native American style sweat tent (traditionally used for prayer and healing), ice plunge pool, and fire pit. Some of the classes were questionable (one teacher promised to transport campers to another dimension, where they could meet an alternate reality version of themselves) and it is not as ‘removed’ from society as could be – there’s some noise pollution from the Bedouin Oasis tourist camp and bar next door, which plays music into the early hours. In the unlikely event that it’s bad weather, it’s also worth postponing your trip due to most sessions taking place outdoors. When staying at Alma, campers can choose from four different diet plans: juice fasting, raw, vegan and paleo. When BBC Good Food Middle East visited, the vegan menu was left wanting – dinner was a single large Portobello mushroom and sauce, although delicious, the portion size was a little small after a full afternoon of exercise. The paleo dinner however was significantly better, including a delicious chicken breast and roasted veggies. The juices at the camp are supplied by Detox Delight, and are available both as part of the juice fast or as a snack for non-juicers (the pink berry juice is particularly delicious). The Instagram-perfect chia and fruit breakfast pots were tasty and definitely worth a try. Details weekend packages start from AED 700. The retreat is also available for corporate and private events. Visit Alma or contact info@iamalma.com or +971 (0) 543 270 408 for more information.